Discussion in 'Miscellaneous' started by Gary7, Apr 15, 2019. The corner stone was laid 1163. We're watching it burn away. Also they had just moved many of the statues about a week before to a different location. That's a good thing for sure. Yes, I believe it was partly due to the renovations going on. So there's at least that. It'll take a few days or weeks before the extent of loss is known. Unfortunately they have lost all that beautiful glass. That is one of the more glaring tragedies, as the light coming through that glass was one of the mystical, revering experiences inside. No doubt that very highly detailed photos have been taken of everything, so hopefully they could make highly detailed replacements so at least visually it would be hard to tell the difference. Nakita Akita and Zander like this. I was there a few months ago and was amazed at all of the incredible artwork inside, the paintings, carvings, tapestries, etc. It would be tragic if one of those was lost but I fear most of it is gone. What miserable news to wake up to. I've always thought I'd like to see it, to go to Mass there one day. At least it's not completely destroyed, but all that history and beauty gone. Awful. NY Times: "By late evening, the Paris fire chief said that the structure, including the two towers, had been saved, but that two-thirds of the roof was destroyed." Thank the Parisian fire fighters for their quick work, to contain the damage at least this much. ITDUDE, StarCruiser, Nakita Akita and 1 other person like this. I felt awful when I saw the news blurb on my phone at work. That cathedral was so beautiful. Disney did extensive drawing and notes on the cathedral when they were making "The Hunchback of Notre Dame." Hopefully they can help too. It's a damn shame to lose such a historic building but I'm just glad no life was lost. This is a damn shame. As easy as something can be rebuilt, you just can't rebuild history. One can only hope they'll rebuild it stronger. All this discussion is reminding me of Ken Follett's Pillars of the Earth and the tragedies surrounding their cathedral. The first pictures of the interior give cause for hope. It seems that most of the vaulted ceiling held up. Even the linen on the alter appears to have survived. Not sure about the state of the windows. StarCruiser and Random_Spock like this. I'm sure there is old growth somewhere in the world that can be used, but wood today is structurally different due to our environment. That's one of the reasons reclaimed wood is so popular and valuable right now. But I for whatever reason I struggled to imagine. I appreciate the help. I imagine we have enough data to fully recreate it. I wouldn’t be surprised if there were some 3D scans made at some point. Random_Spock, Peach Wookiee and Scribble like this. It's not unheard of for movie production companies to be called on for restorations and recreations of historic buildings and objects, but I think you're probably right that there is probably more data on Notre Dame than just about any other structure on this planet, photographic and laser-scanned. Random_Spock and Awesome Possum like this. I think Disney may have done 3D scans or models of the cathedral. I know they did many drawings. Random_Spock, Scribble and Awesome Possum like this. It sounds like a lot of the artifacts were able to be saved, including the crown of thorns and the tunic of Saint Louis. Due to the restoration, the sixteen copper statues had been removed last Friday. It sounds like the organ and stained glass windows were not damaged. Back in 2008, Universal Studios Hollywood experienced a major fire that burned a two-city-block area and the Courthouse Square set seen in Back to the Future. The fire was caused by a work crew using a blow torch to apply singles to roof. They had finished their work and stood watch for an hour. About 45 minutes after they left for a break, flames were spotted. In some ways, this was probably the least destructive moment that the fire could have happened. No people around to be injured or killed. A significant number of artifacts moved off to make way for renovations. It is tragic that there has been some loss of priceless artifacts, but had this wake-up call occurred later AFTER the renovations were completed (I could not find any indication of funding allocated for a newer and more effective fire suppression system), much more would have been lost, and quite possibly human lives. Photos of damage: PHOTO 1, PHOTO 2. Those photos made me profoundly sad. The first with the cross almost hurts. I do believe she will be salvaged and restored. 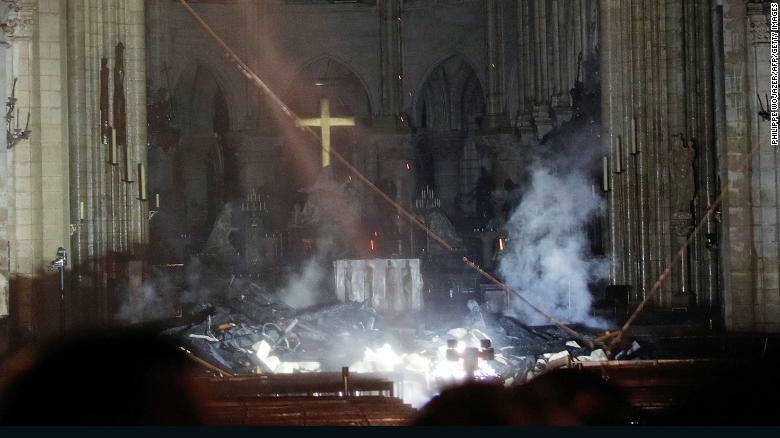 They were apparently able to save a lot of the art works and relics and three of the rose windows survived and the basic stone structure seems to be intact. Who says there are no more miracles. Avro Arrow, Nakita Akita and Random_Spock like this. Sorry but I loathe religion, one less building that hangs to that misguided self righteous belief no matter what the historical significance isn't a bad thing.